Britmoji is the first in a series of keyboard apps designed to take visual communication to the next level. 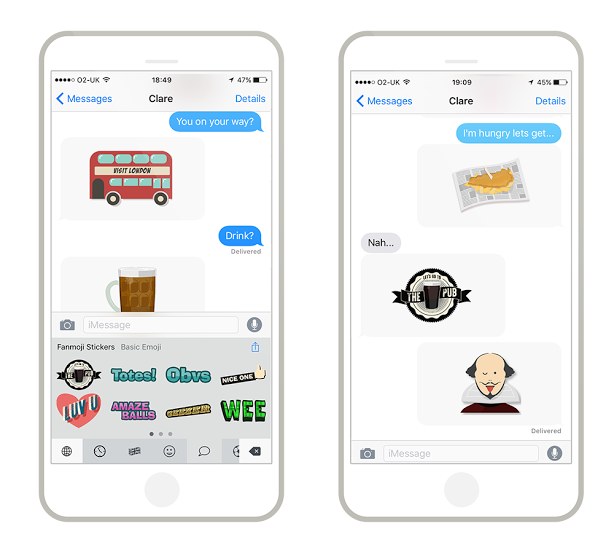 Brits can now communicate via emoji stickers in a truly British way, thanks to British startup Fanmoji. They’ve launched an exciting app featuring more than 125 truly British emoji stickers, with Apple naming it one of their Best New Apps for October in the App Store. The app allows people to communicate in a truly British and highly visual way, with stickers for everything that makes Britain great - from the Queen to the pub to a nice cup of tea. Fanmoji founder Tim Webber says they are perfect for everyday conversation - everything from arranging to meet your mates in the pub to expressing your emotions in a truly British way. “Emojis are great, but because they’re for everyone, they aren’t really personal and specific to any set of people." "We thought there was so much great stuff about Great Britain, like the food and drink, sport and phrases - not to mention iconic figures like the Queen and Shakespeare - that we deserved our own set of icons,” he said. The Britmoji app integrates into the user’s keyboard on their mobile phone, enabling them to use stickers in iMessage and many popular messaging apps like WhatsApp. The app is available for iPhone in the App Store for £0.79, and in Google Play for Android users for £1. Fanmoji is giving away 75 free downloads of the Britmoji app to journalists and bloggers for review purposes. For more information, please contact Fanmoji founder Tim Webber at tim.webber@fanmoji.co.uk.